The French startup ePawn launches ePawn Arena, a revolutionary board that interfaces with smartphones, tablets or PCs, to allow gamers to use real world game pieces with their online and mobile devices. Leveraging ePawn’s patented object-tracking technology, ePawn Arena bridges real and virtual gaming by bringing back the simple thrill of real touch feeling and breathing life into mobile game pieces and smart robot-toys. 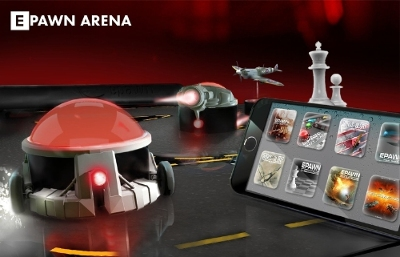 Designed to support numerous games, like a game console, ePawn Arena comes with action games where smartphones drive the toys, a chess game where gamers play online with real game pieces magically moving on their own and strategy games with beautiful and interactive miniatures. ePawn Arena is ready to get new content and the free Software Development Kit (SDK) makes it easy for game developers and hackers to integrate ePawn Arena into both new and existing games. Dieser Eintrag wurde veröffentlicht in Crowdfunding, English, Fun und verschlagwortet mit Board, epawn, games, Kickstarter von Sebastian Trella. Permanenter Link zum Eintrag.